Thousands of Bosnian Muslims and guests all around the world gathered in Srebrenica on Wednesday to mark the 23rd anniversary of Europe's worst massacre since World War II and attend the funeral for 35 recently identified victims. The memorial center in Potocari — just northwest of Srebrenica — is the focal point of remembrance for friends and relatives of the more than 8,000 people, mostly men and boys, murdered by Bosnian Serb militias. Among this year's guests will be a Turkish delegation led by Justice Minister Abdülhamit Gül as well as onetime Serbian presidential candidate Cedomir Jovanovic. Thirty-five recently identified victims will be buried in a collective funeral. Tears and silence accompanied the scene as dozens of green coffins were lined up side-by-side. Emotional scenes ensued as relatives of the victims bid their last farewells. "Never Forget" — a slogan born out of the Srebrenica genocide — was displayed everywhere. After this year's funeral the number of burials in the cemetery will rise to 6,610. Vesid Ibric, only 16 when he was killed, will be the youngest victim to be buried this year. Sahin Halilovic, the oldest, was 71. Remzija Dudic, who was brutally murdered by Serbian troops despite being 6 months pregnant, will also be laid to rest. 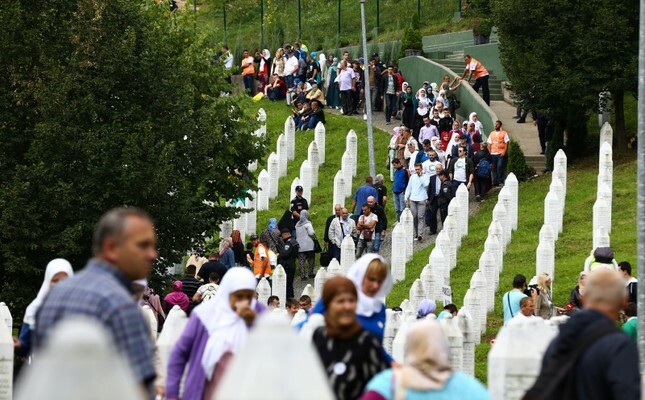 "Srebrenica has become a global symbol for genocide, a warning that no more genocides should happen anywhere in the world," said Nermin Alivukovic, the president of the commemoration's organizing committee, the Associated Press reported. Experts are still excavating more victims' bodies from hidden mass graves throughout Bosnia. Many of the remains were torn apart and experts have had to use DNA analysis to put a body together from bones found in locations miles from each other, as the perpetrators tried to hide the war crime. "Across the region today there should be commemoration and remembrance of the victims of the Srebrenica genocide. Unfortunately, this is not the case," said Dunja Mijatovic, the Council of Europe Commissioner for Human Rights, who attended the commemoration. "As anytime I come here, words do not come out easily," she said. "These steles, those names engraved in the cold marble, this beautiful landscape that so starkly contrasts with the evil that happened here, stand as testimony of the cruelty that human beings are capable of when they are imbued with propaganda and prejudices, fear and hate." More than 8,000 Bosnian Muslim men and boys were killed after Bosnian Serb forces attacked the United Nations "safe area" of Srebrenica in July 1995, despite the presence of Dutch troops tasked with acting as international peacekeepers. The U.N. Security Council had declared Srebrenica a "safe area" in the spring of 1993. However, Serb troops led by General Ratko Mladic — who was convicted of genocide and war crimes charges by the International Criminal Tribunal for the former Yugoslavia (ICTY) — overran the U.N. zone. The Dutch troops failed to act as Serb forces occupied the area, killing about 2,000 men and boys on July 11 alone. Some 15,000 Srebrenica people fled into the surrounding mountains but Serb troops hunted down and killed 6,000 of them in the forests. So far 6,610 victims have been buried at the Potocari Memorial Centre. At last year's commemoration, 75 Srebrenica victims were interred at the site. A total of 8,400 people remain missing since the war's end, according to the Institute for Missing Persons in Bosnia and Herzegovina.